I've never done a giveaway before, and now seems like a perfect time. Watch the video if you like seeing me make a fool of myself, & then read the specifications below. Contest ends midnight CST on Friday, January 15th. & that is all. Thanks, darlings. Ooooo I've been eyeing this wallet for one of the lovely ladies in my life! oh, and i love the glasses. You're adorable, girl! Love the glasses, I want some now! ha ha ..you are sooo adorable Addie! I love Giveaways..especially when the merch is amazing! I love how you look in your 80's coolio glasses! That is such a cool wallet! Your glasses are awsome! I am following your blog as wendy wallach and congrats on your first giveaway! I was going to ask about the glasses, very cute. cute wallet! my email address is daveloughrey@comcast.net (my husband's, we share :) and i'm already a follower of your blog. Oh, me! Me pick me! Hehe. Lovely purse, darling. That wallet is soo cute! I would have bought it if I had the dang money. The giveaway works too though. My e-mail is abatra94@gmail.com, and I'll follow your blog as soon as I finish this comment! That wallet is Adorable! You always make great things, I'm jealous of your sewing skills. I'll totally give it a loving home! if I didn't need glasses I'd wear them too!! the wallet is GREAT and if you just sneak me some directions or point me in the proper directions I'll make my own!! oh and also I'm stalking, I mean following you now! yay! Hey addie this is Seven gothictanys fiance well im entering to help her chances of winning the prize are better so yeah hope to chat with you soon and hope everything is cool with you. so yeah take care and keep up the good work. 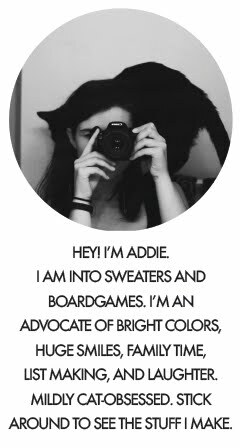 Addie My dearest! It's your Michigan Friend. Greetings. I watched your video and you are officially an 11 on a scale of 1 to 10 cuteness--just thought I'd throw that out there into cyber-space for you. Anyway, We should definitely videochat at some point, Love. I miss you. Rock on with your amazing work, my "designer friend"! I absolutely LOVE every piece on the website...it's all very ... ME ! Such a cute wallet! Thanks for the chance!